Tiramasu Tea? 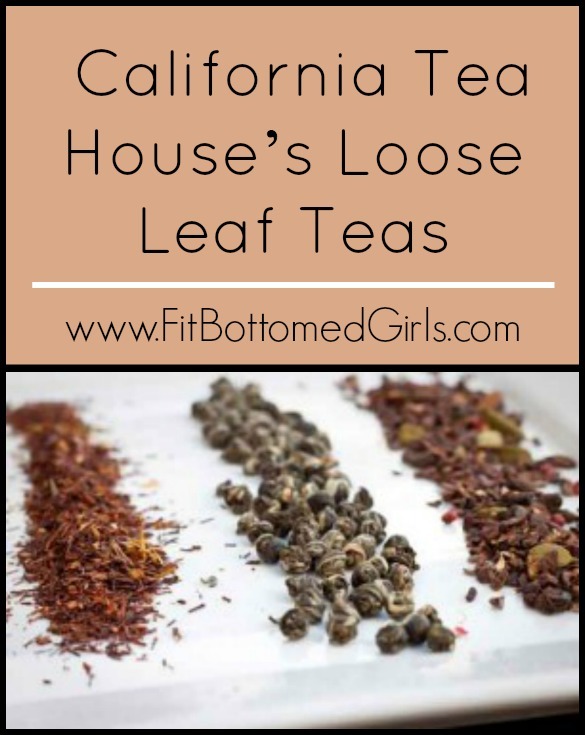 Pour Us a Cup of Loose Leaf Tea, California Tea House! Tiramisu Tea? Pour Us a Cup, Please! I’ve been drinking tea for awhile, but it’s always been the tea-in-a-bag variety. In fact, it wasn’t until a few months ago that a few of my friends introduced me to loose leaf tea. And ya’ll, it’s been tea-rific heaven ever since. 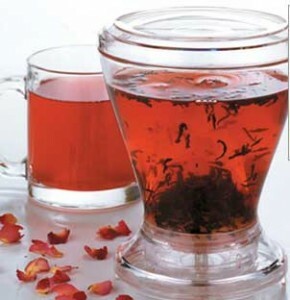 There are tons of loose leaf teas out there and because teas in this format are usually higher quality, fresher and contain more of their essential oils than bagged teas, they’re a touch healthier, too. So when Tish and I had the opportunity to try a few of California Tea House’s loose leaf teas—one of which was tiramisu tea!—I was excited. It’s like a whole new tea world out there! The Sleek Steep Teapot is seriously cool. First, I was amazed by the Sleek Steep Teapot ($18) that California Tea House sent with the tea. Yes, teapots can be amazing (at least for me). You simply put the recommended amount of loose leaf tea (for what I tried, it was one to two tablespoons), let it steep and then you place the bottom of the teapot over a cup. When you press down onto your cup, the tea flows out from underneath of the teapot. When you lift the pot off the cup, it stops. Seriously, amazing. And easy. In my cool teapot, I brewed two types of tea: White Monkey Paw Green Tea and Tiramisu Rooibos Tea. While the green tea was probably the strongest green tea I’ve ever tasted, it was also the most flavorful I’ve ever had. Granted, I used way too much tea the first teapot I brewed, but it was a whole new experience from my usual bag of green tea. And then there was the Tiramisu. Made of the super-popular and super-healthy rooibos tea plus toffee bits, white cocoa butter splits, hazelnuts and cocoa, a cup of the stuff seriously smelled just like tiramisu. While the actual taste once brewed wasn’t as much like the actual dessert as its smell was, it was still pleasant, sweet and could kick a dessert craving to the curb (or at least delay it for a few hours). I found that drinking it in the afternoon or at night—when I have a mean bout of the need-to-munch-sugar-now-but-I’m-not-hungry cravings—was a great way to get my fix calorie-free. And because rooibos tea is caffeine-free, I could drink it any time of day without fear of it keeping me up. Tish tried Lemon Meringue Pie, which led to a little meringue dance-party in her mouth. She’s known for liking coffee with her cream and sugar, so her trying a tea sans sugar and actually liking it was some kind of wonderful. In fact, she told me she was voting lemon meringue pie tea for president. Another rooibos tea, with handfuls of lemongrass, lemon preserves and vanilla bean bits, Tish called it a taste explosion. She recommends using only one scoop of the good stuff though. According to her, you have to “ration the ish!” Especially since none of these loose leaf teas are cheap. 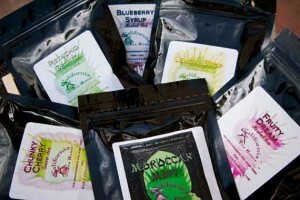 A little does go a long way, but all of the varieties we tried sell for $10 to $20 for just a few ounces. Mmmm the Tiramasu sounds delicious! I like loose leaf in theory but I always end up using wayyy too much. I’m a big fan of loose leaf tea. I probably keep David’s Teas in business. My two current favourites are Pumpkin Chai for the caffeine containing variety, and Cinnamon Rooibos Chai for the caffeine-free. There are so many delicious varieties I need to try though!